We are engaged in manufacturing and exporting Wooden Card Holder. Our skilled craftsmen specialize in the production of wooden visiting card holder. Card holder has the capacity to hold a number of visiting cards. This Playing Cards Wooden Boxes looks very stylish. These playing card boxes are available in good combination with brass inlay & wood. Wooden visting card hold made with teak wood, leather belt.On this we can do customation like name company logo, initial. Good finished card holder with good shined polished. 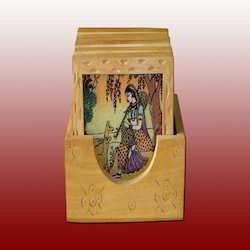 We offer a complete range of high quality of Wooden visiting card holder. We offer Gem Stone Card Holder with Pen Stand to our clients. 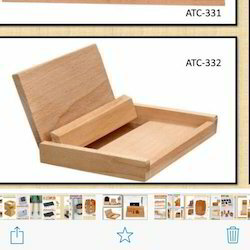 We have various kind of Wooden Visiting Card Holder. Made in Shisham, Haldu and other kind of wood. Available in various size, design or as you wish.